Our clients represent national, multinational and international businesses and organisations. All important sectors of industry, private and public are represented among our clients, and our aim is to enhance and develop their security by building/growing their competence to effectively act and react to the cyber threats. We are involved in numerous projects every year and our client base is constantly growing. We have worked consistently to build up our experience, right from the start, and have successfully implemented best practices when it comes to solutions, methods and tools in the fields of cyber threat reaction and mitigation. Our experience is built also on the long-lasting experience of our founders and shareholders. Continuing to build and develop our knowledge of different industries and market sectors is also a vital component of our ability to ensure that we provide best solutions for our clients’ unique requirements, taking into account their specific environment. By facilitating the sharing of our experience and knowledge within and between different sectors and industries, our clients can significantly benefit. BANKING We provide a full CERT support for a number of the largest banks operating in Poland (both Polish and international). Almost all banks existing on the Polish market are or have been using our CTI (Cyber Threat Intelligence) services, among them two largest banks. One of the largest Polish banks outsources its SOC operations with us. 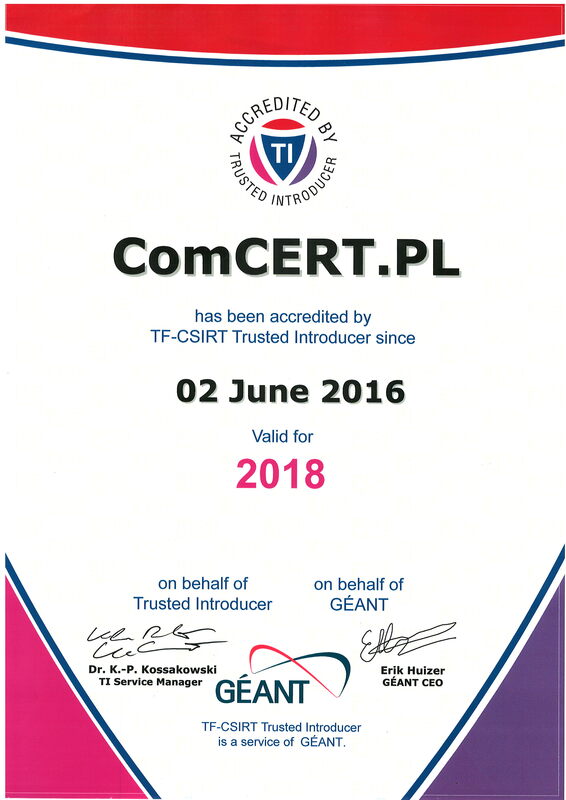 All CSIRT teams at banks in Poland which belong to the Trusted Introducer initiative, used our services to prepare them for the accreditation or certification. A majority of the largest Polish critical infrastructure companies in the electro-energy sector are or have been using our services. We assist them in building their IT security capacity by exercises, audits, CSIRT teams building and supplying CTI data. E-COMMERCE We have delivered consultancies and audits to a number of leading e-commerce companies in Poland, including the largest ones. Our services covered the technical infrastructure analysis and systems hardenings. ComCERT is CERT for the Chancellery of the Polish top legislative body. ComCERT supported a leading professional organisation in delivering malware analysis methodologies to the uniformed services. Every year of its existence ComCERT and its experts deliver new documents ordered by ENISA (European Network and Information Security Agency), comprising best practices, new standards and propositions of exercises for the CERT teams. We have already delivered 12 such documents. Most of the ENISA CSIRT exercises were created by ComCERT and its consortium partners. ComCERT experts deliver the services to a number of foreign customers, like government of Georgia (project financed by European Union Delegation to Georgia), or government of Bangladesh (project financed by World Bank). We have run our CyberEXE nad CERT Games exercises in a number of countries, like the above, but also Bulgaria, France, Poland.